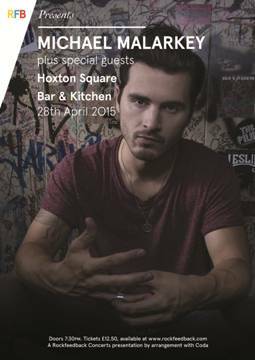 Actor turned musician Michael Malarkey (https://www.facebook.com/mkmalarkey) will be playing his second London show on 28th April 2015 at Hoxton Square Bar & Kitchen. Michael is most famous for his lead role in the American hit series Vampire Diaries, where he plays the notorious vampire Enzo. Following up from his first sell-out London show at Wilton’s Music Hall back in January, this will be Michael’s second show on UK soil, his first gaining great feedback and support from Q Magazine, Hunger and MTV Iggy to name a few.